The integration of data and video, and voice communication in computers and the subsequent technological advances have spawn many sophisticated CTI applications that have become accessible and affordable to the small and mid-sized business. The increasing CTI applications coupled with the growing demand for corresponding hardware and systems have created a dilemma: How does one pack the growing number of equipment into an existing space? ACME's 1U slim industrial monitor keyboard, the SMK, is the solution for compacting more computing power into limited space. This revolutionary monitor keyboard combines a spectacular display coupled with a keyboard with built-in pointing device in a compact unit that measures only 1U in height. Occupying a fraction of the space of traditional monitor and keyboard units, the installation of the SMK leaves ample space for other critical components. With built-in analog-to-digital conversion board, the SMK can be connected to any standard VGA graphics card for immediate On Screen Display. 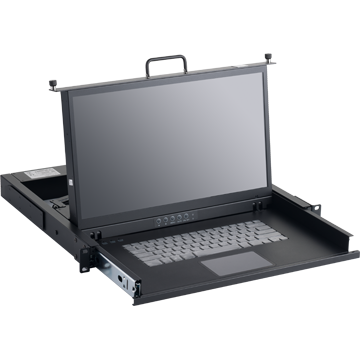 The monitor key-board unit has a built-in slide rail and mounts easily onto any 19" rack mount cabinet.